We have a great new update for you to download. This update has been several years in the making and for those with a "New FamilySearch" account you will be especially excited. We've published a few videos showing you all about the new FamilySearch tools. 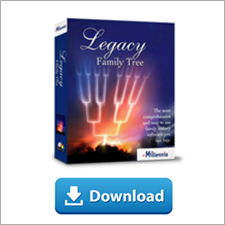 Visit www.legacyfamilytree.com/fs.asp and click on the links in the Video Tutorials section. Everyone. This update includes much more than the new FamilySearch integration features. Since our last update we've added several minor enhancements and fixed bugs that you've reported. There is no cost for this update. If you've already installed Legacy 7.0 (standard or deluxe editions) just follow the update instructions below. The FamilySearch tools are included in both the free standard edition and the deluxe edition. If you do not yet have Legacy Family Tree, and you want to utilize the FamilySearch tools, you can download either edition. New FamilySearch integration. We've written about this many times. Click here if you've missed the articles. After installing the update, you will be asked if you want to turn on the FamilySearch integration tools. At this time only LDS members should say yes (FamilySearch accounts are currently restricted to members of the LDS church while they conclude their testing). The FamilySearch tools have been officially certified by FamilySearch, but the tools are still in "pre-release mode". This means that 1) not all of the features that we want to implement are available, but we want you to get started (the rest of the features will be released in version 7.5) and 2) there are still a few minor (non-critical) bugs to resolve. As with any new update, we encourage all users to make a backup of their family file. Do this before installing the update. It's pretty simple. Just go to File > Backup Family File. If you have questions, suggestions, or just want to discuss the new FamilySearch features, subscribe to our new mailing list at http://www.legacyfamilytree.com/LegacyFSList.asp. You will need to visit our website. Go to http://www.legacyfamilytree.com/DownloadUpdate.asp and follow the instructions. 1) Filter your list in many ways. For example, just show your first four generations and work to complete them. 2) Overall progress. As you complete the tasks (matching, combining, syncing, ordinances) for each person, watch as the progress bar moves closer to 100%. Now you have a manageable project. 3) This is your filtered list of names. The colorful icons show you the status of each task. 4) View the list of tasks for the current person, view and navigate their pedigree, or view additional information about the person. To learn more about Legacy and New FamilySearch, please visit www.LegacyFamilyTree.com/fs.asp. If San Luis Obispo, California is within driving (or flying) distance, we hope you'll join us next week for a great seminar. The San Luis Obispo County Genealogical Society's annual seminar is always one of my favorites. This year won't disappoint anyone. Speakers include Megan Smolenyak, Maureen Taylor, Cafi Cohen, Cheryl Storton, Julia George, and Geoff Rasmussen (that's me!). You'll get to meet Legacy's president, Dave Berdan, and Geoff Rasmussen. We'll have great products for sale at special seminar pricing. We're also giving away a free Acer Netbook computer! To register, or for more information, please visit http://kcbx.net/~slogen/10seminar-sched.html. Hope to see you there! Legacy's To Do List is one of the software's most useful tools. Depending on your preferences, it can be used as both a To Do List (what you plan to do) and a Research Log (what you have already done). You can add new To Do items as you think of them, or Legacy can create tasks automatically via the Research Guidance tool. Learn more about the To Do List by clicking on the To Do List section in this video. "I have a question about the To-Do List. I select print from the To-Do List in Research Guidance. I get each to-do item on a separate page. Is there a way to get a list of my to-do items on a single page?" Well, I have too many items to have them shown on just one page. But here's what I do to shorten my To Do Reports. 1. When you click on "Reports > All Reports > To-Do Items" a window opens with four tabs. [You can also click on the Print button when you are looking at a person's To Do List.] Under the first tab "Record Selection" go to the bottom of that tab window and make sure the box next to the following text is empty: "Start Each Task or Repository on a New Page". In this way tasks will continue on page by page without any page breaks between tasks. I also leave the next box blank as well: "Don't Split a Task Over a Page Break." I don't care if a task is split between two pages. When I take a paper report with me, I punch the pages for three holes and place them in a binder or report cover so that the report is easier to use at the archives. So splitting a task is not a hassle for me. 2. Then go to the second tab titled "What to include." Here I go down to the third section on the table and look at the "Notes" section. To the right of the word "Notes" are two boxes. The first box allows you to change the number of lines you want in the Notes section of the To Do report. If I am looking at a vital records index and have only a small amount of information to write down on my To Do Report when I take it to a repository, then I don't need 10 or 15 blank lines in my report. So, I would reduce the number to 1 or 2 lines. Secondly, I can either have the blank lines either lined or unlined. The box to the right allows for that. 3. I can also shorten my To Do Report by excluding various information which is shown on the second tab titled "What to include." So, before I create a report, I review these items to see what is not needed for my report that day. This can change each time I issue a report based on what my specific needs are. This also relates to the third tab entitled "Filter Options" which can impact the size of the To Do Report. 4. And then there is the fourth tab entitled "Sort Order" which I change based on what I want the report to show. Among these four tabs are a lot of variables which I change based on what the report I create is to show. Including or excluding these items will impact the length of your report. So, play with them to see how something as simple as a sorting change can increase or decrease the length of the report. One of my favorite reports is based on the repository which I plan on visiting. When I go to a specific archive or library, I print a report for only that repository and arrange the sorting of items based on how I expect to search at that repository that day. Then I would take the report and systematically work through the report at the repository finding each item that I have listed on it which makes my time at the repository go very efficiently. For example, when going to a research library, I check the library catalog online before I arrive at the library and include the library's call numbers in the tasks in my database so that the call numbers print out on my To Do Report. As soon as I arrive at the research library, I begin writing out the call slips and in minutes the research materials are placed in front of me. This allows me to efficiently use what time I have at the research library. If I sound enthusiastic about the To Do Reports, it's because I use them all the time and would recommend Legacy on the basis of the To Do Reports alone! The first thing I do in the morning (after taking my new puppy outside) is spend a few minutes in front of the computer. After checking my email I have a short list of websites that I like to view (national news, Eastman's Online Genealogy Newsletter, local news, and weather). In the past I've either typed in these web site addresses or used my Favorites links to view each page. Now I use Internet Explorer's Home Page Tabs. So, when I launch Internet Explorer (and I'm sure the Firefox and Chrome browsers would so the same thing), each of these web pages is automatically loaded on separate tabs - and I don't have to type a thing or click on any bookmarks. When I'm done with one of the sites, I just close the tab and view the next site. 1) After loading one of the web pages you want to view in Internet Explorer, click on the small arrow just to the right of the Home button in the Command Bar. Then click on "Add or Change Home Page". Now, navigate to the next web site that you frequently visit and follow steps 1 and 2 again. If this is new to you, give it a try and let me know how it went. This weekend we brought home our family's first puppy - a Toy Poodle. The next day the breeder called and said they had overcharged my credit card. I thought, "no big deal. It's probably just ten or twenty dollars." Then they admitted it was overcharged by about fifteen thousand dollars. The kids are happy playing with "Lexi" and I'm excited about extending her pedigree. She came with a five generation pedigree chart. I know nothing of canine research methodologies, but apparently, with the right conditions, they can be researched back into the 1800s. Set the quick book-mark so I can always return to the home person easily. Set the direct line as preferred. 25 million new free records added for Argentina, Australia, Brazil, Dominican Republic, England, Germany, Guatemala, South Africa, Switzerland, and the U.S. There were 22 collections added or enhanced in the latest update. Many happy researchers will search eagerly through the 25 million new records in this update! The records can be found at FamilySearch’s Record Search pilot (FamilySearch.org, click Search Records, and then click Record Search pilot). Be sure to share the good news with family and friends. See the chart below for a list of all the newly added collections. None of this would be possible without the great contributions of many online FamilySearch volunteers. These individuals donate the time and talent needed to make these collections freely available to FamilySearch patrons. Find out more about volunteering at FamilySearchIndexing.org. Thank you! Buenos Aires City—1855 National Census - New index and image collection. 1869 National Census - Updated collection. Project is now complete! N.S.W. —Index to Bounty Immigrants Arrivals, 1828–1842 - New index and image collection and the second Australia collection. Catholic Church Records - Additional images. Civil Births, 1828–1917 - New image only collection. Cheshire—Parish Records, 1530–1900 - Updated index. Cheshire—Bishop Transcripts, 1598–1900 - Updated index. Non Conformist Records, 1671–1900 - Updated index. Brandenburg—Church Book Duplicates, 1800–1874 - Additional images. Posen—Church Book Duplicates, 1800–1874 - Additional images. Baden, Bonndorf— Church Book Duplicates, 1810–1869 - New index only collection. Ciudad de Guatemala—1877 National Census - New index and image collection. Orange Free State—Estate files, 1951–1973 - New image only collection. Schaffhausen—Church Records, 1540–1875 - New image only collection. Arkansas—County Marriages, 1837–1957 - Updated collection. Joint project with the Arkansas Genealogical Society. Florida—State Census, 1935 - New index and image collection. Florida—State Census, 1945 - New index and image collection. Georgia—Deaths, 1914–1930 - New index only collection; ongoing project. Indiana—Marriages, 1811–1959 - Updated collection. Joint project with the Indiana Genealogical Society. Massachusetts—Marriage Records, 1842–1915 - Updated index. Washington—County Marriages, 1858–1950 - New index and image collection; ongoing project. Search these records by clicking here. That's it. I will never be surprised by technology again. When I hear about some new gadget or technology idea - I will no longer think, "yah right, maybe in the future." The future is here. LIke most genealogists, I like taking pictures - pictures of the family, trees, and cemeteries. When I read about Eye-Fi last night, not only did I realize that the future was here, but I also knew that taking pictures would never be the same. Eye-Fi makes your digital camera go wireless. As soon as you snap your picture, it will be wirelessly uploaded to your computer or favorite online photo sharing site such as Facebook, Flickr, Snapfish, Costco.com and more. Imagine the possibilities - you're away on a business trip. Your family back home takes pictures of the day at the park. Without any effort on their part, the pictures are automatically uploaded to a private website that you can view. I live in Arizona. My extended family is all over the country. We don't see each other very often. Next Christmas, while I'm snapping pictures of my kids opening presents, my parents and siblings can watch it all happen - as it happens - as my pictures are wirelessly posted to our family's photo sharing site. Eye-Fi will even geo-tag your pictures. It adds the latitude-longitude information to the picture's metadata so I can view all of my digital pictures by location. Have you ever snapped a picture on a vacation of a famous building? Later, at home, you had no idea where the picture was taken and why the building was so important that you took its picture? Because the pictures are geo-tagged, you can later view it on a map. An Eye-Fi card is similar to your digital camera's memory card. It looks, stores media, and fits into cameras just like a regular SD/SDHC card. On top of that, the Eye-fi card has built-in Wi-Fi that uses your wireless network to effortlessly transfer photos and videos. The Eye-fi website explains that upon setup, you specify which networks the Eye-Fi card uses to transfer your media. Add up to 32 networks for your card to use. The next time your camera is on within range of a specified network, your photos and videos will fly to your computer and to your favorite sharing site. Their site also explains that it can use other available wireless networks and hotspots to upload your media. I certainly don't know everything about this new technology that I want to know, but it's worth checking out. Visit www.eye.fi or watch these videos below for more information. If Mesa, Arizona is within driving (or flying) distance, we hope you'll join us next week, January 22 and 23, for a great seminar. This is the 2nd annual Arizona Family History Expo, which features 82 different classes from nationally-known speakers. We will teach four classes on using Legacy and will have great seminar-special-pricing on all of our products. As a major sponsor of this event, we will once again give away hundreds of dollars of great prizes, including Legacy Family Tree software and an Acer Netbook computer with Windows 7. I love my Acer netbook, and love giving them away (comes with Legacy software too!). Come visit us in booths 15 & 28. For more information, click here. As the 1920 U.S. Census project wraps up and the final states are published, FamilySearch has now opened up indexing for the 1910 U.S. Census! Patrons can freely search the indexes for the 1850, 1860, 1870, 1880, 1900, and 1920 censuses at the FamilySearch Record Search pilot. Additional international indexing projects were added in December 2009 for Argentina, Belgium, Colombia, France, Germany, and the U.K. Note: The last of the states for the 1920 U.S. Census will be posted to the Record Search pilot online as they go through the final stages of publishing preparations. You can choose which projects you want to help index. ** Special Offer: receive 20% off for a limited time. See below for details. Have you ever said to yourself, "I wish I would have known that when I first started!" I recently discovered a "new" button in my photo editing software. The button had been there for years, and had I known about it in the beginning, I would have saved hundreds of hours over the years. My tasks would have been so much easier. The same concept holds true for Legacy Family Tree. While the software is quite intuitive, it is robust enough to meet the needs of all genealogists. The Legacy Training Videos on CD teach you how to "do it right the first time." After viewing the CDs, you will be able to spend more time researching and less time learning how to use Legacy. The videos, which you watch on your computer screen, are presented by professional genealogist, dynamic speaker, and Legacy expert, Geoff Rasmussen. 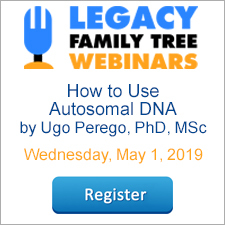 You will benefit from his years of research experience - not only will you learn how to use Legacy, but you will learn how to most effectively use it. ** Until January 15, save up to 20%. See below for details. Save 20% until January 15, 2010. Click on the Legacy Home tab. Look in the Legacy News section for your private coupon code. Deluxe Edition users of Legacy Family Tree received 20% off. Standard Edition users received 10% off. To upgrade to Legacy Deluxe, click here.